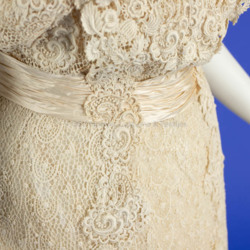 Off white lace dress with ruched silk cummerbund and silk banding around the hem. 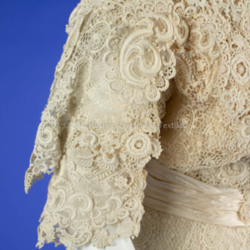 3/4 length sleeves with square neckline. 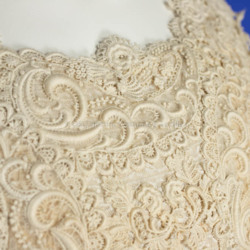 Multiple layers of lace appliques on bodice. 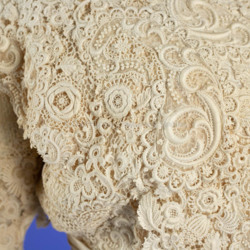 Hook and eye closure up the back (34). 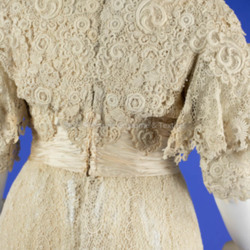 4 pieces of boning built into dress, cinching belt on the inside at waist. 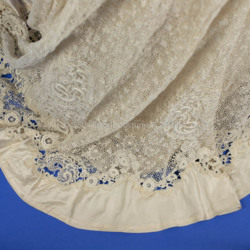 This gown belonged to Rose E. Lazarus, wife of Fred Lazarus—co-owner of the F. & R. Lazarus store. 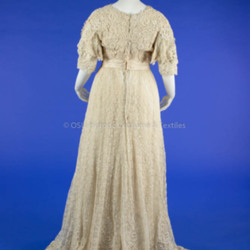 Rose was born in 1861, so would have been in her late 40s when she wore this dress. 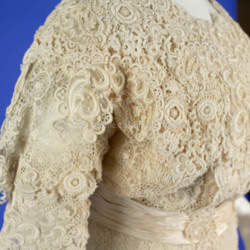 It is attributed to Mary McCormick who is mentioned in Lazarus family papers at the Ohio Historical Society as Rose’s dressmaker. 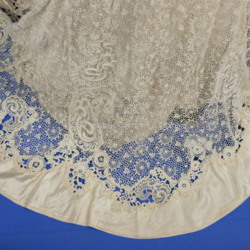 We have not been able to find much information about Mary McCormick in Columbus, but did find a Mary McCormick that was a dressmaker in Zanesville in the 1890s. 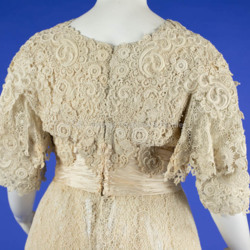 Since we know that other tailors and dressmakers relocated to Columbus to work, it is possible that this Mary McCormick did so as well. 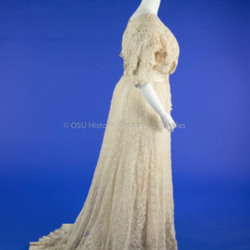 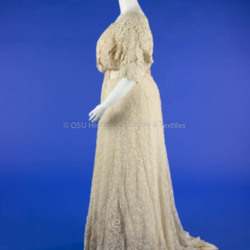 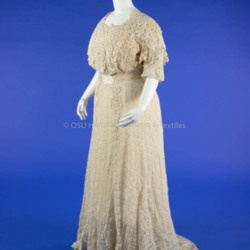 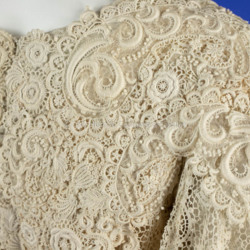 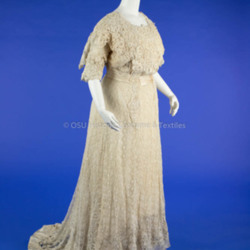 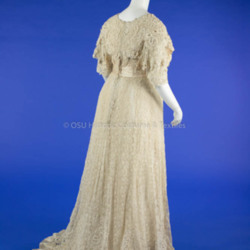 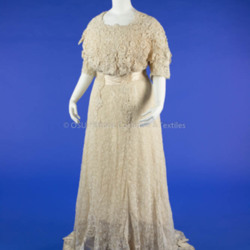 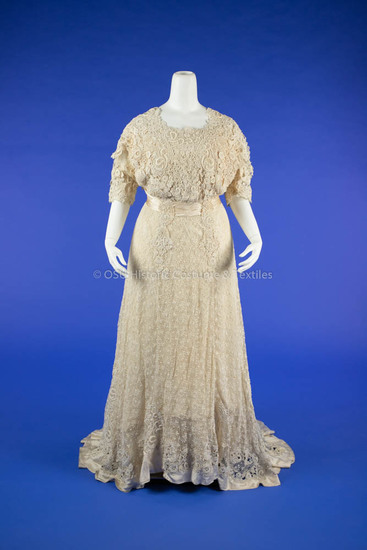 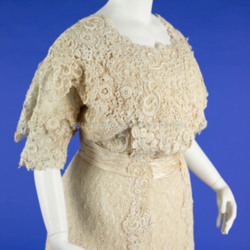 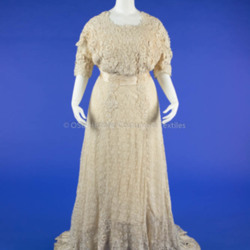 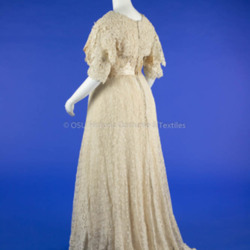 “1908-1910 White Lace Dress,” Fashion2Fiber, accessed April 24, 2019, https://fashion2fiber.osu.edu/items/show/5082.